Bench #7 acknowledges that Bench #6 was hard to follow. I decided to use this an opportunity to change scale. Bench #7 is the first 10 foot long bench that I had designed. The combination of White Oak and Maple contribute to the sense of size with the maple legs defining the boundaries of this bench. The legs are massive expressions in stacked up and shifted maple. The stretchers are in on the action in this unique bench too. One of them actually pierces through the White Oak seat and sets off a bunch of details that are quite engaging. 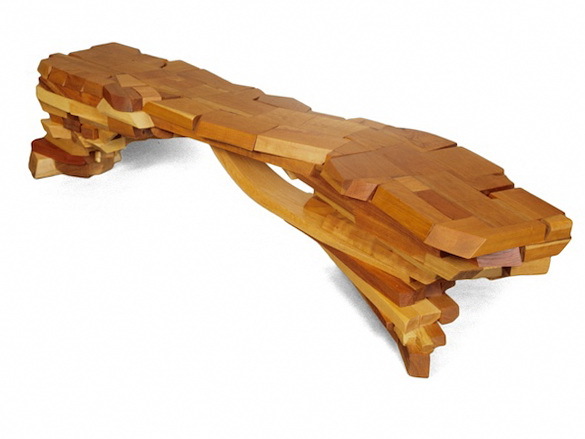 These are the details that make these benches more about sculpture and composition than mere function. 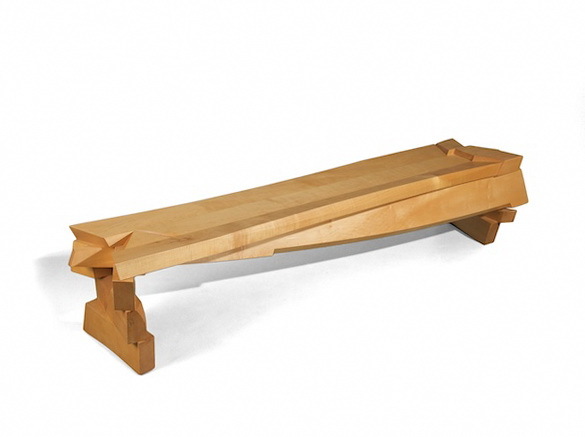 Bench #6 is a contemporary bench presented in White Oak. The wood is glued together in an undulating wave. The individual piece become part of a greater composition, just like in all of my work. The bench was designed for an open space. I feel that there is just too much movement for this to be used as a hallway bench or a foyer bench. This could be a loft bench or used as a lobby bench for sure. 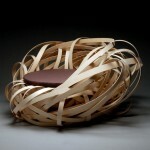 The sweep of the wooden wave/back imparts a sense of wonder that needs to be seen from a bit of a distance. Bench #5 was born of my thrift. These scraps of wood were piling up in the corner of my shop. I used them to cobble together Bench #5. The process was fluid and completely different from the benches that had preceded it. The result was a unique bench within this series of unique benches. I was forced to approach my style from a new perspective. I tried to maintain my voice with a completely new language. The thread that binds this bench to the rest of the series is the notion of spontaneity and the fact that I am essential to the process. This bench clearly was composed one piece of rubble at a time, by me. 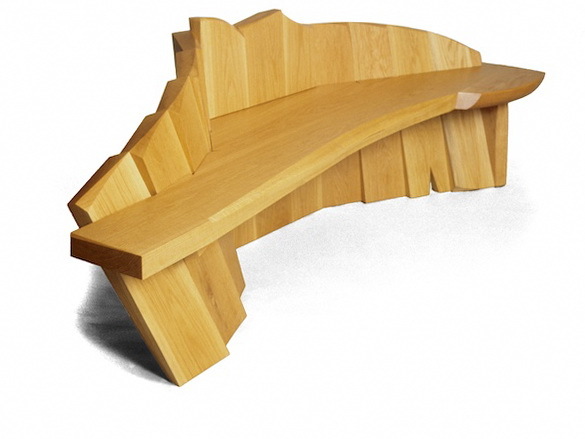 Bench #4 is built around the notion of a conversation bench. The two half backs face each other encouraging people to face each other. Perhaps this is why some people refer to this sort of bench as a kissing bench? My interest was the potential for asymmetrical composition that the two backs present. 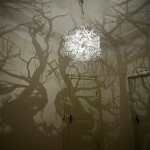 They are quite different and encourage the viewer to move around the piece. 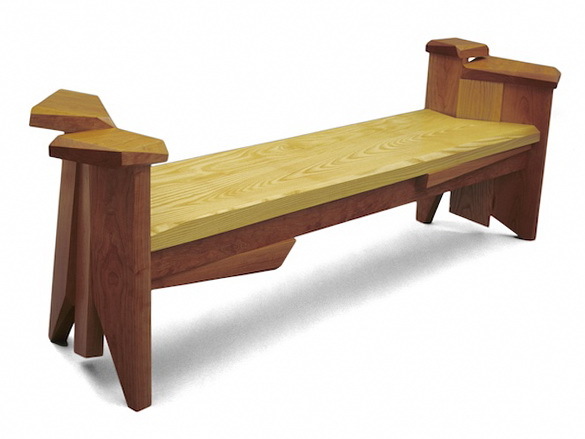 The bench is presented in a combination of Cherry and Ash. I have filled the grain of the Ash with pigment to help bring the color in line with the Cherry. Bench #3 represents an important moment for me in the series of benches. The seat was conceived of as a landscape with a mountain range that pushes out of the right side. I did not want the seat to be flat due to the potential for greater comfort. Function is an important part of my work and this exploration. 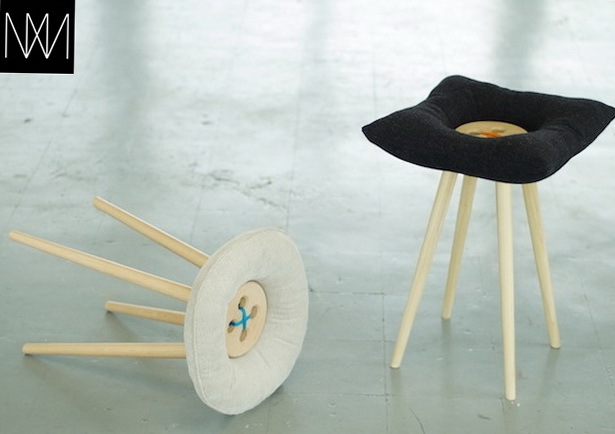 The solution was to angle the seat so that it cradles the body. I was so happy with this feature that it is standard on all of the benches in Bench Series #2, my series of indoor/outdoor benches. 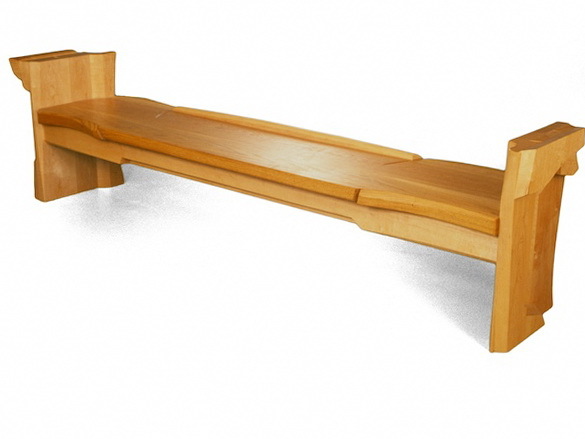 The legs and stretcher of this 96” maple bench showcase my structural style. Each component is visible and is composed in the moment by me. These are all handmade benches after all! Bench #2 was the bench that made me decide to pursue this subject as a numbered series. I thought of it as a continuation of the exploration started in Bench #1. This too is an indoor bench, but the final destination is no longer known. 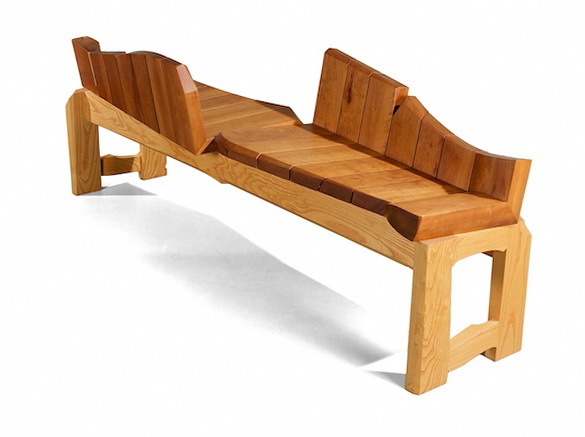 The bench could end up as a hallway bench or a window bench? My interest was designing a dynamic composition that could thrive in any situation. 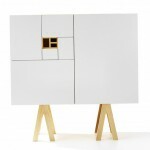 The wood is a combination of Mahogany and White Oak. The Oak anchors the right leg and the half back on the left side setting up a diagonal movement throughout the piece. 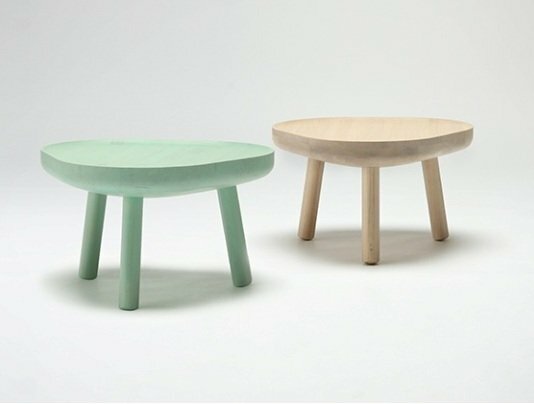 The left leg terminates at the benches back with a flat surface that can be used as an arm rest. 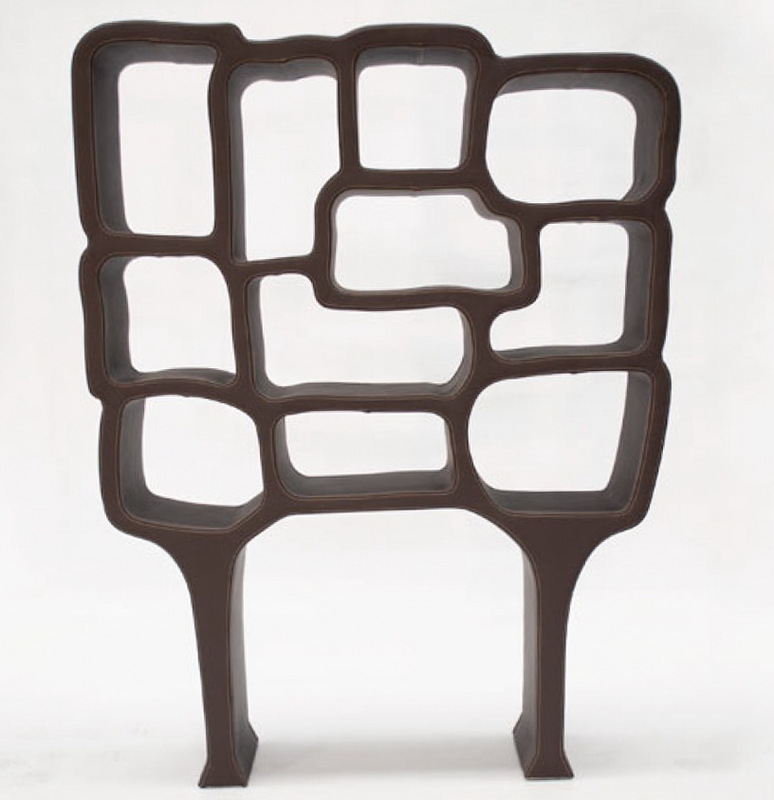 The Mahogany seat has an unusual shape that employs my layering approach to building up surfaces. The layers are shaped and create “moments” that are vital to the composition. Bench #1 started the whole series of indoor benches. The bench was a commission for Abbey and B.H. Friedman. They had discovered my work at the Elaine Benson Gallery in Bridgehampton, NY. Their apartment in New York City was full of world class art, much of which was made for them. B.H. Friedman is the expert on Jackson Pollock. B.H. educated me in terms of the commission process. He expertly guided me to what he wanted while insisting that I make an original piece in my voice. 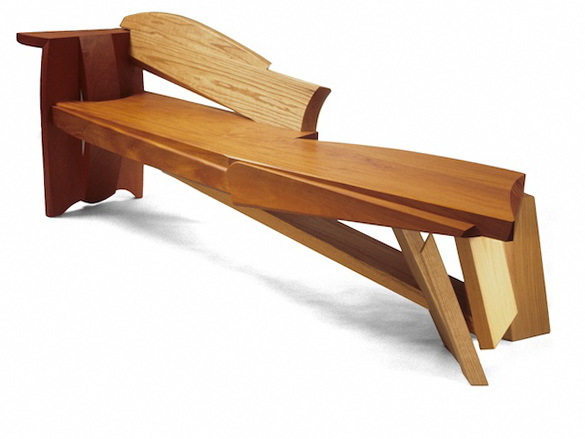 The result was this unusual bench presented in the combination of Cherry and Ash. Bench #1 was designed as an entryway bench so I used the asymmetrical composition to greet the visitor and visually bring them further into the space.